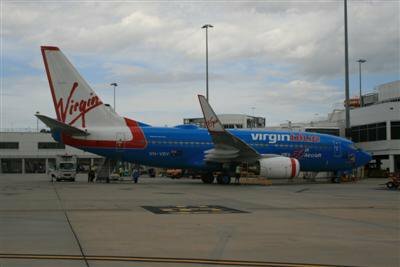 PHUKET CITY: At a time when the Phuket tourism industry could use some good news, Australian low-cost carrier Virgin Group has applied for permission to begin a daily service from Australia to Phuket, according to a company press release published this morning by online Australia-based tourism industry newsletter etravelblackboard. If approved, it would be Virgin Group’s first destination in Thailand. Applying for the Pacific Blue brand with hubs in Brisbane, Melbourne and Sydney, Virgin Group applied for “seven weekly services between points in Australia and Thailand” specifying that “Pacific Blue will operate these services to Phuket utilizing 180 seat B737-800 aircraft”. Virgin Group, which has reportedly sought the right for five years, hopes to use it progressively until it reaches the seven services by April next year. However, the report expressed doubts about the viability of the service if flights are to be undertaken with the Boeing 737-800 aircraft. While the aircraft is a stretch version, it is uncertain if it would successfully fly an eight-hour non-stop leg at the maximum capacity of passengers and cargo. Virgin Blue was sought for comment but was not able to make a statement at this stage, according to the report. Phuket Poll: How do we brand the virus?